A chance to explore the exhibition 'Colin Self: Art in the Nuclear Age' with the curator. 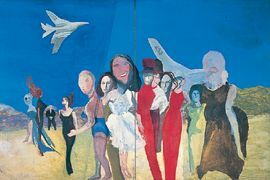 A leading figure in the 1960s British Pop Art movement, Colin Self (b.1941) is best known for his explorations of life during the Cold War period. While his work has depicted many aspects of modern consumer culture including glamorous Sixties models, hot dogs and stylish Art Deco cinemas, it has also addressed the darker side of the epoch: ferocious guard dogs on missile bases, women in fallout shelters and the threat of nuclear weapons. This retrospective features works from the 1960s to the present day.